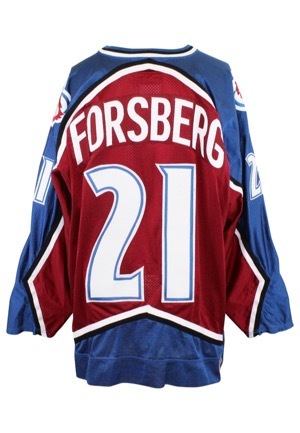 A two-time Stanley Cup Champion, Peter Forsberg was inducted into the Hockey Hall of Fame in 2014. 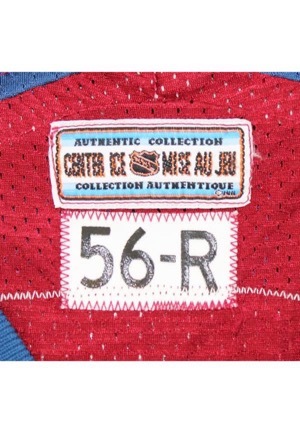 Inside the rear neck is a strip tag reading “56-R”. 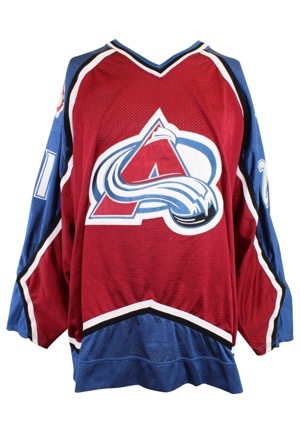 Adjacent above is a NHL “AUTHENTIC COLLECTION” tag. On the right inseam is a flag tag with washing instructions. On the outer rear right tail is the official “STARTER NHL” embroidered logo. On front is the team’s large “A” logo crest. Player number “21” appears on back and on both sleeves in white on blue on silver sparkle tackle twill. Player name “FORSBERG” appears on back in white tackle twill on a burgundy nameplate. The fight strap is intact. On each shoulder is the “Bigfoot” patch. This jersey is properly tagged, was presented to us as game-used and in our opinion, shows light use. Please note that a correction and/or update has been made to this lot since its original posting.